My last bottle of this vintage. Drinking very nicely - much better than the previous bottle I shared with friends 7-8 months ago which was slightly oxidized. @jmdavidson1 Tell me that’s a VDDD wine…or making fun of them! Drove down to Missouri (with an additional 6 cases of wine in tow, plus a lot of other stuff) and rewarded us (my wife and I) with a bottle of 2013 WineSmith Meritage (that was already at the house from a previous trip). Hats off to the Tour-ists! Just had a 2013 Revelry and their blending skills have produced an excellent and age-worthy wine. Sure, Peter helped with the growing of the grapes, picking, pressing, fermentation, aging, bottling, labelling, blah, blah, blah. Well you all created a really great blend! Glad you like it! I have been hoarding mine as others have said it needs an hours-long decant but sounds like it is entering its drinking window now. There were 32 of us, so we split into 4 groups of 4 to start. 16 of us went into the lab and 16 waited in the tasting room. Each group came up with an initial blend, then 4 more groups of 4 went into the lab to tweak our blends into 4 final blends which we voted on. There was a tie between 2 of the blends, so we tasted again and voted on just those 2 to determine the winner. Ironically, as part of the first set of 4 groups, our initial blend was almost identical to the winning blend but the group that was supposed to “tweak” our blend scrapped it altogether and started over. Their final blend was not one of the 2 that tied in the first vote. 50%Cab Sauv, 16%Merlot, 15%Cab Franc, 12%Malbec, 7%Petit Verdot. 50%Cab Sauv, 15%Merlot, 15%Cab Franc, 15%Malbec, 5%Petit Verdot. @chipgreen @woopdedoo Yeah, we were in the first round also and had the same thing happen. I don’t recall our blend, but it was heavy on the PV, as all four of us liked it. Also drinking a Bonus Level 2014 PS - Wow, it can still use some bottle time. @woopdedoo I’ve crammed my bottles wayyy back in the back. I’m hoping to wait for it to be 10 years old to pop the first. @FritzCat @radiolysis Had to give it a try - was rummaging around some of my as-yet-unboxed stuff and wondered how it was coming along. Not that it was a PS, but Boss Monster took a while to mellow out. 2015 Shafer TD-9, their Right Bank Bordeaux Blend. Very good. Lots of flavor throughout the palate, long finish and great mouthfeel. The nose is good, but nothing really comes out of it, except perhaps some licorice that also shows up in the flavor. I am an over-extracted oak loving kinda guy, the sort that likes Caymus. This Shafer is less fruit-forward, although it is has lots of flavor, and I would consider it more restrained. Just finishing the dregs on the 3rd day, and it just keeps getting better. Decant! 2013 Campesino Alina with grilled Mediterranean sea bass, grilled zucchini and oven roasted potatoes. NV Hidden Legend Pure Honey Mead. My first ever mead. Tasted like boozy honey? @ScottW58 No postings? All is well? Feudi di San Gregorio Irpinia Serpico 2003. @chipgreen @jmdavidson1 @ScottW58 Offend? Ha! Jealous, well, maybe a little. But I’ve zero to kvetch about, especially tonight. Second half of 2011 Wellington Mohrhardt Ridge Cabernet with a mismatched 12 oz Flannery rib steak. I don’t care if they’re mismatched if they’re always this tasty. Damn good stuff! @jmdavidson1 how was this JM? @ScottW58 Delicious. Better than the 2001. THe balance of the rat bottle from last night. Still tasty! Enjoying a 2014 Praxis Merlot, from last month. Pretty bold up front and spicy. Medium tannins. Smooths right out at the end. I’m going to give it a few more months befor I try again. Very good. A little acid for me, but I like my wine like my women. Good with food, and a fantastic nose. I am finishing up my 2007. It’s only “mostly dead”! What do you think? I have come close to pushing the button on Meadowcroft a few times, both here and other sites but never quite did. I have enjoyed all four that came in the pack last June (I think). If order again if they were to appear. I’ve not jumped on any of their whites since I don’t really drink much white. Thanks, maybe next time they are up I’ll bite. Am a heretic if I say that I’m drinking a Mondavi Private Selection Meritage 2015? @ejrunion Not sure why you would say that? how was it? @ScottW58 My wife and I enjoyed it very much. I felt like it was more old world than CA: full-bodied but without being tannin-rich, spicy and sharp in aroma. The Casemates boards do seem to eschew the wines found on the shelf in most normal wine stores for $10. My WineSmiths, Wellingtons, Scott Harveys, Pedroncellis, et al, are in my cellar for special occasions. They are my precious jewels! I am very thankful for the Casemates discount on wines because it makes your amazing wines fit more into my very ordinary Joe salary. My palate is being refined by you guys, but my wallet has to be able to keep pace! Thanks for asking. @ejrunion @ScottW58 @Winedavid49 Glad you enjoyed it! That’s the point, after all. There are some good wines at grocery stores, there’s also a lot of plonk. I like picking up some Dry Creek Vineyard Fume Blanc - it hits my style preference for that grape. I’ve also been lucky enough to find some Bell at my local Safeway/Vons. @ejrunion @klezman @ScottW58 @Winedavid49 I do find myself eschewing (thanks for the opportunity to use this word!) $10 wines on the shelf these days. I might get some varietal I’m curious about a couple times a year at Trader Joes, but usually for <$10. My main cellar defender is 3L Trader Joe’s box wine, Chardonnay (sometimes Pinot Grigio or Sauv Blanc to mix it up) and Shiraz. Including tax, that’s like < $3.50 / bottle. Quality varies, but average is certainly better than $3.50/bottle level. The worst was a couple months ago where I thought, yeah, that’s down toward $3.50 / bottle, but it still wasn’t horrible. I’ve also had a couple Shiraz boxes where the quality was quite high. @klezman @PatrickKarcher @ScottW58 @Winedavid49 NY doesn’t allow wine sales in supermarkets, so we have to rely on liquor stores. While we have some amazing retailers, the CA collection of wines seems to be based upon the big wine conglomerates - those mass produced for type and interest. I saw a Pedroncelli once, and every time I ask about other wines I have seen on Casemates I get a quizzical look. Imagine my shock when my family camped in Lake Tahoe two years ago and got groceries at a Discount Grocery Store. We found Dry Creek Valley reds for $7, and some other gems for between 6 and 10. Needless to say, I am very envious of your selection and opportunity! You have some amazing retailers in New York that don’t cater to the big box Cali wines. If you’re looking check out Chambers, Crush, Astor, Empire or even wine library to name a few. We had a few and they’re marked down at K&L to $25. We picked up two additional. 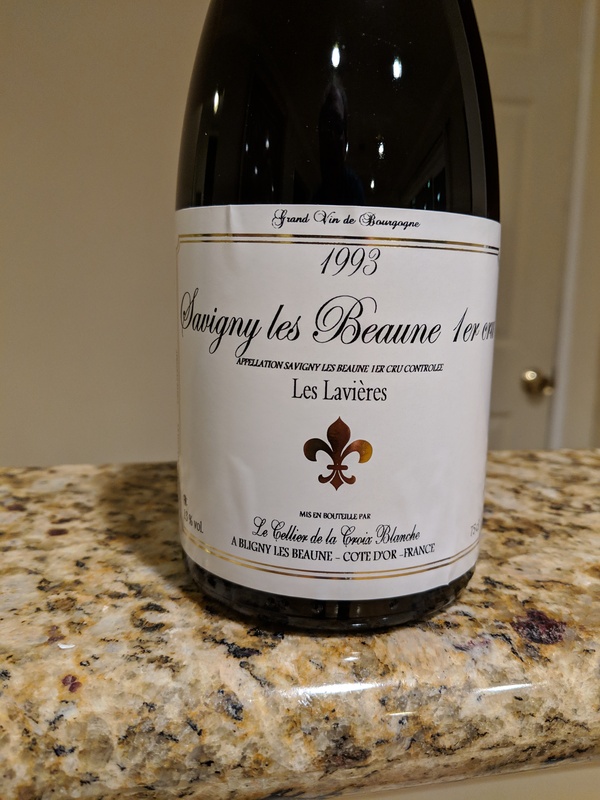 Did an older Burgundy that was very good! Popped one of the Leoni farm zins tonight to try. Very surprised by how good it is, very layered. Glad I grabbed a case. 2011 Jean Edwards cab 74/41 with prime NY strip. Tannins well integrated, oak in check, good fruit. It’s drinking well now, but I’m in no rush to crack my remaining bottle. Noticed that TSO had more of these so time to pop another one with grilled Tri-tip and a bunch of leftover crap from this weekend Love this wine! @ScottW58 Dang, when did they sell them? I’d have bought some more. Had a lovely 2016 Gigondas last Tuesday, it was great with the filet of Wicklow beef and the Comeragh Hill lamb (we were in Dublin, having a grand time). Sorry the picture is so dark, the label says Domaine Burle “Les Fouilles”. @ScottW58 Yeah, it’s too damn hot today! Back to normal tomorrow at least. @klezman pretty sure today is the normal? Don’t be fooled by global cooling! @ScottW58 yes, I need to figure that out. Had a fabulous Marsanne/Roussane from Saint-Joseph with low country boil this weekend. A rich front with a beautiful mineral finish. I have a terribly hard time finding any kind of Roussane, and this was a great surprise. @erisire I remember very much enjoying the Roussanne when we visited Cass Winery in Paso Robles a few years ago. 2012 3 Wine Men Cab. Drinking great. Amazing how these wines hold up over time. 2017 Turley Cinsault, Bechtold Vineyard. One of my favourite finds of the tour last summer. The 2018 gets released in a month or so and I need to check whether it’s a stock up sort of wine. Yes, I want a few bottles of this. Fresh, juicy, lower alcohol, and still with some depth and savouriness. Ron Says: “Deep & Rich” Distinctly different than the Shiraz (Mollydooker Blue Eyed Boy) that Judy likes. Distinctive body and good fuityness. I like it much better than the shiraz. Mellowed with air. I like it too. Judy likes the Mollydooker much better. No accounting for tastes. 2009 Eagles Trace Latitude 38, this is drinking wonderfully! Made a Rosti threw a runny fried egg on it with some Marie Sharps Habanero pepper sauce and I am very very happy! Had to google Rosti. Now I’m hungry! Looks kinda like Boxty, which I love. Heh, I edited out the corned beef comment since it didn’t match the pic but yeah, I have had corned beef between boxty at a local Irish pub. @chipgreen @karenhynes @ScottW58 Boxty, we just had it last week in Dublin! Clearly I’ve been sheltered, I’m more about the potato latkes, not sure I knew about boxty. We saw it on a food/travel show on Netflix, before our trip. That looks great, with the corned beef. And yes, @InFrom, there is a bit of a difference between latkes and rösti, but not a ton. Rösti are usually much larger than latkes, at least the ones I make! 2015 Balletto Pinot Noir, RRV, with pesto linguine and shrimp. …and a cannoli. Apparently Pinot goes really well with cannoli. Well, since the Clue thread is broken and I had to dine tonight without the company of my virtual pals to entertain me in figuring out the next offer…I thought I’d introduce you to my “date” for the evening. Casemateys, meet Mr. April. I’m with Scott on this one! Just trying to keep y’all entertained! Hey, @ScottW58, how do I post pics? @ScottW58 Probably just the nerd in me, but I love the label - very Star Trek-y in the typeface department. Looks like it jumped out of a video game. Agreed! But I say that’s a feature not a bug. Or just upload the image directly to Casemates via the same button without loading to Imgur! TJs Brut Rosé. Nothing super complex, but went well with sushi. @InFrom This was a freaking delicious wine. Touch of Brett, lots of earth, deep fruit, and still shockingly youthful. A lot of similarities, actually, to the 2005 La Lagune that Scott brought. Agree really delicious and very happy to finally get to try that wine, thanks! @FritzCat did you use an ah-so? @Winedavid49 I did not…I don’t have one…Amazon to the rescue. Thanks for the suggestion. Could we get a clue in the “what are you (perhaps in the future) drinking tonight” thread here? Or just fix the Clue thread? …or start a new Clue thread? @chipgreen @karenhynes @rjquillin @Winedavid49 Just having both the recent Rose and the SB. Both excellent. The SB is, for me, the perfect blend of fruit and minerality. Happy I got a case. @CorTot how is it? Wine house had a couple cases marked down to $25 or so. @klezman I’d say it’s decent at $25. Under $20 an absolute buy. @CorTot Do artichokes attenuate the flavor of red wine for anyone else? @FritzCat I’ve never really noticed it, but I typically spend so much time trying to convince my kids to eat the artichokes that I stop focusing on the wine. 2013 Dominio del Plata Ben Marco Malbec to go with grilled salmon (with a teriyaki sauce), Hawaiian rice and steamed snow peas. Snow peas. How appropriate for today. We had flooding and tornado warnings here although supposed to get a “wintry mix” overnight. As of a couple of hours ago O’Hare reported 5.3 inches. Some of the north/northwest burbs reported over 8. It’s still snowing now (at least where I am in the city). I guess I should expect a messy drive in the morning. At least it should melt away pretty quickly. Well I want to see a picture of a wine bottle chilling in the snow! @ScottW58 If I knew how to post pix, like you, I would do it. (Technology challenged). BTW, the snow is already melted. Happy to see my lawn again. 2007 Beni di Batasiolo Vigneto Corda della Briccolina to go with Costco chicken, orecchiette in a mushroom/fontina/parm sauce and al dente broccoli. Gloria Ferrer blanc de noirs With a grilled rib chop, risotto and fresh bread. @CorTot Make or buy risotto? What kind? @rjquillin week nights we do a hearty risotto as a main dish with chicken and veggies in it. Tonight’s was a side so we used Emirils 3 cheese risotto, pretty damn tasty. All the risotto recipes I’ve seen/used have the liquid added incrementally to the rice. I like the dump and stir aspect. Now, if only swmbo liked risotto as much as I do. @CorTot @rjquillin No need to do incremental additions. Just ask Kenji! @CorTot @klezman @rjquillin Pressure cooker version is nice. Haven’t tried Kenji’s method. Where the heck did that come from. and some relatively spicy green salsa. Nice to have a well-stocked wine cellar. 2013 Betz Family Cuvee Frangin with grilled lamb chops, parm. potatoes and creamed spinach. With Chicken Adobo, both so good! @ScottW58 I always wonder what to pair with adobo, the vinegary-ness of it. With grilled salmon, 2000 Arcadian Franchesca Pinot, easily the greatest california Pinot I have ever had the pleasure of drinking by a country mile! And a recent club release I don’t know how Joe dose it? That is some high praise! Great cork integrity, that surely helped and between that and the pristine appearance of the bottle/label, great provenance too (as you would expect from the winery itself). Arcadian is great…too bad they didn’t participate in BD this year! 2008 Bugay Vyds CS Incline One-Five Rsv. Prime drinking window and a steal from the winery. @hscottk look at this guy! @ScottW58 Really hard to go wrong with a Cabot. Even if it is an infant. 2016 Scott Harvey Mountain Selection Barbera. Fresh from the FedEx delivery. Furthermore Wines Blanc de Noir with fried calamari. 2007 WineSmith Pinot Noir with chicken vesuvio. You predict poll questions too now? Wishing I had some mags of this. @rjquillin Dark fruit,spices. For me this is in prime drinking time however no rush needed has long life left. Indian creek '08 old vine red with Mexican food. 2008 Charles Woodson Twenty-four CS. How was it, I enjoyed my 08’s , have some 09&10 left. @rc70 Very good. I, too, have 09’s and 10’s. Per CT, this one of the three was the most approachable, based on the drinking windows. A well-crafted wine worth the reasonable TSO price. Decanted for an hour, which helped. @chipgreen thoughts on the OTP rosé? Decent. Can’t complain for $7. There was something just a bit “off” on the palate, maybe some slight bitterness and/or salinity that seemed to interfere with the otherwise cherry/strawberry flavor profile. It wasn’t chilled as much as I would have liked, which may have played a role in my perception of it. 2017 Pedroncelli Rosé of Zinfandel. Trying to boogie through this vintage so I have room for the 2018. With molarchae not drinking right now I get to try everything on day 2! Brought these to Easter dinner. All were tasty! @ScottW58 Mismarked benchmark bin sale item. Delicious. CS/Mer/PV. Not many wine blends like this come out of Italy. Still have an '06 and an '07 to drink=lucky me. A wine I’m sure you would have enjoyed. @ScottW58 Not a typical flavor profile for PN, would you say?